Mythmaker: The Life of J.R.R. Tolkien by Anne E. Neimark. Review: Have you read The Hobbit or Lord of the Rings by J.R.R.Tolkien? 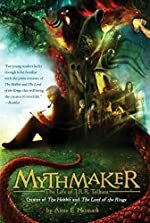 If you liked those books then you will like Mythmaker. Mythmaker by Anne E. Neilmark describes Tolkien's Journey and inspiration to write his books. In Mythmaker we learn all about Tolkien's life. The book begins with him being a child in Africa climbing a tree. Later they move to England, and Tolkien's father dies. Tolkien's mother teaches him and his little brother, but soon his mother dies and they are taken to a Catholic orphanage and are kept safe by Father Francis. Later Tolkien meets his love, Edith at the orphanage but Father Francis will not let him marry her or contact her so he can focus on his studies to get into the Oxford University. Although he is accepted and earns his degree he is pulled away for war before he can marry Edith. Eventually however he is able marry her and raise a family. Through learning about Tolkien's life readers will also learn about his inspirations for writing some of the most famous books in history. Mythmaker is perfect for readers of all ages. Anne Neimark is an excellent writer and she shared the story of a fascinating person who became an amazing writer that wrote about all kinds of tales filled with mythology. Her easily understood and interesting writing style keep readers enthralled. Therefore Mythmaker is an all around great book. We would like to thank Houghton Mifflin Harcourt for providing a copy of Mythmaker: The Life of J.R.R. Tolkien for this review. Have you read Mythmaker: The Life of J.R.R. Tolkien? How would you rate it?